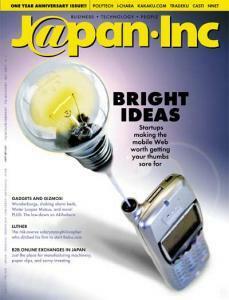 On the cover: Bright ideas stemming from a bright idea, with a little help from Photoshop. In June we showed you the importance of Japan's wireless Web. This month we show you the startups that are making it happen. People around the world admire the creativity that goes into Japanese gadgets. We share some of our favorites, like the wonderborg, the Water Looper Mutsu, and the vibrating alarm bed. His personal Web site led to the formation of one of Japan's top online brokers. But the securities industry here still has him pulling his hair out. The researchers at Kyoto's Advanced Telecommunications Research Lab are working on an artificial brain that'll be faster than ours -- and now they've got a mascot. Japan ranks last when it comes to the ease with which domestic companies can hire foreigners -- a bad sign for tech ventures. A 16-year-old collaboration between universities and industry -- mistakenly dismissed as a failure -- gains new relevance. A quick rundown of the more interesting strategies, developments, and applications in Japan's wireless Web. His kakaku.com offers price comparisons on products sold in Akihabara, Tokyo's famous electronics district. And he no longer gets chased out of stores. This young fella is on the cutting edge of the wireless Web and looks destined to be a serial tech entrepreneur. Some of the best tech ideas in Japan are to be found in universities. He's making sure professors can profit from them. The bandwidth business is a lot like the drug business. You have to get people addicted before they realize they need m-m-m-more bandwidth. The perceptions of land as an asset are changing. Banks may now be willing to lend to startups on the basis of a business plan. On the biggest ISP in Japan(i-mode), B2C by categories, the online-trading explosion, and the rapid rise of m-commerce. A bird's-eye view of one of the most promising sectors on earth: B2B ecommerce in Japan. Funerals in Japan are cumbersome and outrageously expensive. Net startup Polytech intends to make them less so. Ventures we're keeping an eye on. This month: Yourstep, NeuroGrid, Campuspark. I-Chara is applying artificial intelligence to human networking. But only humans with cell phones, mind you. B2B online marketplace TradeKu wants to simplify the import/export biz. After success with a few mobile Net sites, ISP and content creator Nnet is selling the tools it used to make them. A reckless tromp through Akihabara, Tokyo's electronics shopping mecca. Mitsuo Yamaguchi creates flower art that's unmistakably by computer and yet as simple -- and complex -- as the real thing. Japanese convenience stores have it all: beer, socks, game software, CD-Rs, french fries, and, now, high-interest loans. Want ketchup with that?